The outbreak of the crisis in Syria in March 2011 has resulted in the emergence of new social, political and economic conditions for the Syrians that have been forced to abandon their homeland and seek shelter from the violence and terror in other countries. This crisis has had devastating impacts on the citizens of Syria, as many have lost family members, friends, neighbours, as well as their homes and livelihoods. In addition to experiencing intolerable violence, they have also endured dramatic decreases in their living standards, including rapidly rising poverty levels, diminished purchasing power, inequality and discrimination in their recipient countries, and numerous barriers to accessing housing, jobs and social services, such as education and health care. According to recent reports from the United Nations High Commissioner for Refugees (UNHCR), as of August 29, 2014, more than 3 million Syrians have fled the country, while another 6.5 million have been displaced within Syria. Of those that fled in search of safety and shelter, the majority became refugees in Lebanon, Turkey, Jordan, Iraq and Egypt. There are currently 1.5 million Syrian refugees in Turkey, three-quarters of which are women and children. This already exceeds UNHCR planning figures for 2014, which expected the number of Syrian refugees in Turkey to reach 1.3 million by the end of this year, with a projected increase to 1.6 million by December 2015. This high number of Syrian refugees is largely due to the fact that Turkey essentially practices an open door policy with regards to Syrian civilians seeking to escape the violence in their country. Although accepting so many Syrian refugees may have enhanced Turkey’s image in the eyes of the international community, responding to the needs of such a large number of people has created many challenges and issues for the nation and its citizens. According to UNHCR, upon their initial arrival with little more than the clothes on their backs and what they managed to carry, the Syrians “receive an ID card, which provides access to free health care services in Turkish clinics, as well as other aid provided by local municipalities, non-government organisations and other aid agencies. The card is a critical document that also shows refugees have the temporary protection of the Turkish government”. However, although Turkey practices an open door policy in terms of allowing Syrians to seek refuge from the violence in their home country, they are not granted refugee status. This is because Turkey only grants refugee status to people originating from European countries in accordance with the Geneva Convention of 1951(established to protect European refugees) and the Protocol of 1967 (addressed all refugees worldwide), which define the status, as well as the social and legal rights of all refugees. Turkey initially labelled the Syrians entering the country in the early stages of the conflict as “guests”, later modifying it to people under “temporary protection”, while not clarifying the precise meaning of this designation. The term “temporary protection” has also not been formally defined by UNHCR. The most likely reason that the Turkish government chose to employ this label is because it allows them to withhold certain rights and benefits that the Syrians should be entitled to as refugees under the United Nations Convention on the Status of Refugees (1951), which demands “basic minimum standards for the treatment of refugees”. Together, the 1951 Convention and 1967 Protocol attempt to provide “the same standards of treatment enjoyed by other foreign nationals in a given country and, in many cases, the same treatment as nationals”. The 1951 Convention includes many rights such as “the right not to be punished for illegal entry into the territory of a contracting State (Article 31)”, “the right to work (Articles 17 to 19)”, “the right to housing (Article 21)”, “the right to education (Article 22)”, “the right to public relief and assistance (Article 23)”, “the right to freedom of religion (Article 4)”, “the right to access the courts (Article 16)”, “the right to freedom of movement within the territory (Article 26)”, and “the right to be issued identity and travel documents (Articles 27 and 28)” . Furthermore, if the refugees are forced to remain in the host country for a longer period of time, the 1951 Convention recognizes that they need more rights in order to have security and live with dignity. Therefore, the decision to not grant the Syrians escaping violence in their own countries refugee status is more than an exercise in semantics; it is a cynical attempt by the Turkish government to evade responsibility and deny the Syrian refugees the rights to which they are entitled, which has had a significant detrimental impact on their daily lives in terms of employment, housing, education, and health care. Upon their initial arrival to their host countries, many of the Syrian refugees may not have been aware that they were only at the beginning of a very long and difficult journey, as their safety was their primary concern at that point. Some of them may have expected the crisis to be over by now, which would have allowed them to return home and start re-building their lives. However, recent developments suggest that it may be quite some time before the situation becomes stable enough to return to Syria. Currently, only 100,000 of the 1.5 million Syrian refugees in Turkey are actually living in the refugee camps that have been set up for them. This is likely because the primary objective of these camps is to provide basic needs and they do little in terms of integrating them into society or offering any meaningful employment or training. For these reasons, the majority of Syrians have opted to leave the camps in favour of moving to various cities around the country in search of better opportunities to provide for themselves and their families. In doing so, however, they expose themselves to new challenges, such as obtaining employment, finding shelter, learning Turkish, and integrating into a society where they have no rights. Sinan Gokcen of the European Roma Rights Centre described the situation faced by Syrian refugees as follows: “They live in miserable conditions in informal camps or in abandoned buildings without access to water and proper sewage. Collecting paper and scrap metal are the main sources of income.” Currently, it is not uncommon to see some Syrians, mainly children, filthy and malnourished, begging for money in the streets or engaging in undocumented labor in a variety of industries and businesses including the agricultural sector, restaurants, or peddling small items (i.e. bottled water, toys, tissues, etc.) as street vendors Turkish cities. This is largely the consequence of desperation and frustration faced by Syrian families who are not receiving adequate help and support from the Turkish government or the international community. UNHCR confirmed that 75% of Syrian refugees are women and children, primarily “orphaned girls and daughters of war widows”. While they may have escaped the bombs and violence in their homeland, many have already fallen victim to “criminal rings that are forcing them into sexually exploitative situations ranging from illicit marriages to outright prostitution”. It has been reported that “pimps, matchmakers, drug dealers, and traffickers work in overlapping circles along the border” in order to find Syrian women and girls to exploit, labelling girls aged between 12 and 16 as “pistachios”, 17 to 20 as “cherries”, 20 to 22 as “apples”, and 22 years and older as “watermelon”. The lack of adequate protection and the failure to provide social and economic security on the part of the host country has allowed these women and girls to be preyed upon by criminal and depraved elements of society. Syrian refugees are not the only ones experiencing difficulties; Turkish citizens are also faced with new economic and social realities that have arisen since their arrival. For example, the high volume of Syrian refugees visible in many Turkish cities has significantly impacted unskilled Turkish citizens, as they are unable to compete with the low wages or poor working conditions that the Syrians are willing to accept. More precisely, the high demand for menial work has driven down wages and led to the deterioration of working conditions and labour rights for refugees and unskilled domestic workers alike. This has resulted in some hostility with the local population who feel as though the Syrians are stealing their jobs. Tensions are further exacerbated by the fact that a few of the Syrian refugees have committed crimes, some violent in nature, which have been reported in the news. All of these factors combined have led some Turkish citizens to generalize all of the Syrian refugees in their country as criminals and beggars. As a result, there have been some reports of assaults and protests against refugees in different cities including Adana, Gaziantep and Kahramanmaras. At present, it does not appear as though a peaceful resolution to the conflict will emerge anytime soon in Syria. Even if the conflict comes to an end in a few years, the destruction of so much of the country’s infrastructure means that an extensive rebuilding process will be needed before a sense of normality can be restored in people’s lives. For these reasons, one cannot reasonably preclude the possibility that Syrian refugees will be forced to reside in their recipient countries for many years. That being said, if the Turkish government and international community are not proactive in establishing a stable environment, both socially and economically, for the Syrian refugees they are hosting, their children will most likely grow up without adequate education or the skills they need to achieve success and prosperity in the future. The complexity of the situation requires special attention on the part of the international community, as Turkey, on its own, cannot effectively provide a healthy environment for 1.5 million Syrians and help them deal with the physical and psychological trauma that they have endured. Humanitarian interventions typically have a short-term focus, prioritizing the provision of basic needs and essential services within refugee camps, namely food, water, healthcare and education. While these are obviously important measures, policies should also aim to achieve positive outcomes in the longer-term. For example, a concerted effort needs to be made in terms of providing social assistance to those refugees that choose to live outside of the camps in order to help them better integrate into the society of the host country. Achieving positive outcomes in the long-term would require changes to the Geneva Convention of 1951 and the Protocol of 1967. Specifically, the fact that these laws, as currently constituted, permit the Turkish government to avoid granting refugee status to the Syrians fleeing the violence in their country, as outlined by UNHCR 1951, makes them particularly vulnerable in Turkey. First and foremost, Turkey needs to remove the geographic origins of people as a factor in the determination of whether or not to recognize refugee status. 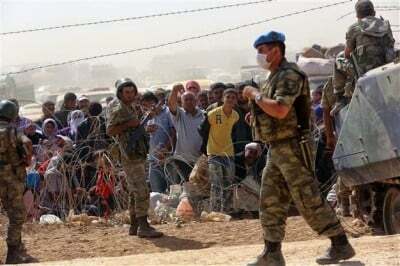 When examining the origins of the Geneva Convention of 1951 and the Protocol of 1967, it is not surprising that they do not adequately address the problems faced by Syrian refugees in Turkey. The initial idea for establishing guidelines and laws for the adequate protection of refugees and their human rights originated with the end of the First World War (1914-1918). However, it was not until 1951, after the end of the Second World War (1939-1945), that the international community actually adopted the Convention on the Status of Refugees, which was subsequently amended in1967. In other words, the 1951 Convention and 1967 Protocol were established in accordance with the geopolitical, social, and economic realities of the time, when most refugees originated from European countries that were heavily impacted by the First and Second World Wars. As mentioned in the previous paragraph, the 1951 Convention and 1967 Protocol, as currently constituted, are not capable of adequately addressing the problems faced by Syrian refugees. As a result, a combined effort is required on the part of the UN and the international community to amend 1951 Convention and 1967 Protocol in order to develop, finance, and implement programs and services to meet the needs of contemporary refugees and ensure that their rights are upheld. First and foremost, changes need to be made to guarantee that all people that are deserving of refugee status, including the Syrians currently residing in Turkey and other countries, are recognized as such, which would prevent governments from evading their responsibilities by employing vague and broad terms such as “guests” or people under “temporary protection”. That being said, it is not reasonable to expect individual countries to meet their obligation of providing “basic minimum standards for the treatment of refugees”, as stated by the 1951 Convention and 1967 Protocol, when they are overwhelmed by the sheer number of people that have crossed their borders. At the moment, Turkey needs to determine a course of action for providing 1.5 million Syrian refugees with their basic needs, in addition to a safe and stable environment so as to allow them to lead their lives with dignity and respect. However, any amendment has to take into consideration current social, economic, and cultural realities of Syrian refugees. The international community, NGOs and recipient countries need bear in mind that the normal lives of Syrian refugees have been interrupted for an indefinite period of time for geopolitical reasons and through no fault of their own. While these refugees occupied a wide range of professions in their home country, including teachers, professors, musicians, artists, bureaucrats, labourers, doctors, mechanics, retailers, etc., they now have to focus on the unfamiliar task of struggling for survival. Without amendments to the 1951 Convention and 1967 Protocol, as well as meaningful financial and institutional support on the part of the international community, Syrian refugees will not receive adequate assistance in the areas of employment, housing, education, health care, productive capacity, and the ability to provide for their families. Specifically, the international community has a crucial role to play in terms of openness, transparency and combating corruption in the administration of refugee programs. Otherwise, they will not be able to enact policies and programs that adequately deal with the social, physical, and economic needs of the refugees in areas that include worker rights, health, education, safety, and human rights. Sound policies will be developed only when the international community makes decisions based on the specific needs of the refugees, which includes the timing, speed, and sequence of the implementation of programs and policies. The international community, host countries, and their citizens need to be prudent and realize that the problems and struggles faced by Syrian refugees are not only short-term in nature; they have the potential to extend well into the future, even beyond this current conflict. It is often easier to remedy problems if they are foreseen well in advance and dealt with through preventative measures instead of trying to remedy them after the onset of a situation and its impacts are entrenched. This view is shared by Machiavelli who stated that “the medicine is no longer in time because the malady has become incurable” (Machiavelli, The Prince, p. 21). Turkey hosts the second largest population of Syrian refugees after Lebanon.